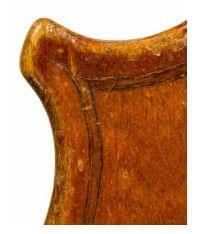 Lot 24 in our October auction will be an immaculately preserved violin by Ferdinand Gagliano, made in Naples in 1789. Realising we had a unique opportunity to gain insights into original materials and techniques, we gave the instrument to luthier, restorer and expert Balthazar Soulier so that he could analyse it in his workshop, Atelier Cels, in Paris. Can you tell us about some of the remarkably preserved features of this violin? Balthazar Soulier: It’s extremely rare to find an Italian violin from the 18th century in such a fine state of preservation. I was deeply moved when I took it in my hands for the first time. First of all, this violin strikes one for the purity of its varnish. Over the years, historic violins usually acquire layers of polish and patina. This instrument on the other hand appears almost ‘unpleasant’ because it looks naked or raw. It appears that it was played for just a few years after its creation in 1789 and then put aside until today. 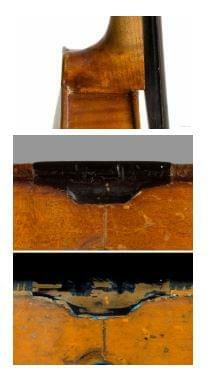 As a result this violin may be one of the best preserved instruments from the whole Gagliano dynasty. It’s a fine and characteristic example of Ferdinando’s work, exhibiting all his stylistic and construction features. Based on his uncle Gennaro’s model, the upper edges are slightly more open, and the arc of the upper and lower bouts goes a little further into the edges. As usual the purfling is made of beech for the middle strip and stained paper for the outer ones. The linings, also of beech, are not mortised into the blocks – which are made of spruce. The upper wing of the treble f-hole is slightly carved down to compensate for the uplift of the wing caused by the pressure of the sound post. The head is also characteristic. 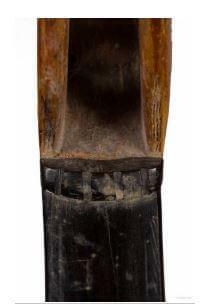 It has a relatively small volute with quite a long peg-box and peg holes placed in two pairs. Besides its main constituents, this violin is particularly remarkable for the elements that were usually modified or replaced during the 19th and 20th centuries. The neck junction hasn’t been touched. Even the fingerboard seems to be original. This means we can get rare insights about the original neck angle and elevation of the fingerboard. The lower saddle is authentic and still covered with original varnish. This gives us key information for evaluating the original angle of the strings over the bridge. 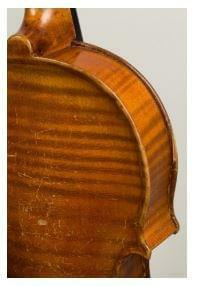 It also indicates that the violin was varnished after the saddle was set. Inside the violin, every surface seems untouched. Its finish is very clean with few tool marks. This means we can study Ferdinando’s working techniques and a possible wood treatment can be analysed. The bass bar, blocks, linings and label are completely original and unmodified. There are just three small spruce cleats glued on the upper part of the belly’s middle joint. Two old cleats are glued to reinforce the lower wings of the f-holes. On the bass side, there are no cracks at all, indicating that these were added as a preventative measure. They look very old and it’s possible they were added by the maker himself. It’s striking that this preventative action was carried out at such an early stage. Returning to the outside, the only modifications we can detect consist of a very old reshaping of the neck, which has been partially re-varnished, the re-gluing of the finger board and the replacement of a small portion of the outer edge of the belly. Some later small rasp marks are detectable on the upper side of the neck above the upper saddle; the (probably) original finger board has at some point been displaced to increase its elevation and been re-centred. Otherwise, the violin bears interesting and pure traces of wear caused by the playing and adjusting of the instrument at an early stage. These provide interesting insights into the behaviour of violinists and violinmaker treatments at the end of the 18th century. The violin has a fascinating handwritten inscription. Can you tell us more about it? Indeed, as observed on several instruments from the Gagliano family, this violin contains an important handwritten inscription in brown ink on the inner face of the belly alongside the central joint. It consists of eight initial letters divided by periods and ending with a cross surrounded by four dots. It seems to refer to a religious formula, though some letters are hard to decipher. Clear is a reference to Jesus Christ and the Holy Spirit. It’s possibly that two letters refer to the maker himself. We find some Gagliano family instruments with printed labels bearing religious mottos. Only a few Gagliano violins bear these mysterious handwritten inscriptions on the inner face of the belly however. As the Neapolitan bellies were quite thick, it’s possible that many of the inscriptions have disappeared due to the re-graduating of plates over the course of history. But it was apparently common in Naples to add a hidden inscription referring to Christianity. Noteworthy is the fact that this inscription is placed where it can’t really be read without opening the violin. Whether these religious symbols were placed in the context of ecclesiastical commands, whether the Gaglianos wanted to confer a sacred status on their work, or whether the family merely wanted to attest the depth of their belief, we can only speculate. Does this violin challenge any of our current ideas about Neapolitan violins from the 18th century, or about Gagliano instruments? One fascinating feature is the presence of spiral bushings in the peg holes and the end-pin hole. As the original varnish partially still covers the surface of the wooden bushing, and no signs of later intervention are visible, these bushings must have been made by the maker before the instrument was varnished. 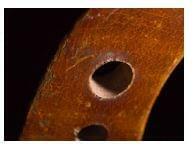 We have already detected original spiral bushing on a well preserved Gabrielli violin from 1769. At this point we can only speculate whether they have added wood shaving into the holes to reduce their diameter, to reinforce the pegbox, or to allow for a better running of the pegs. I believe that in order to conserve this quite unique proof of spiral bushing, one should avoid putting new pegs on the violin. Another interesting feature is the presence of two tiny holes on the belly due to the presence of two locating pins near to the lower saddle and the base of the neck. As the pins are missing, one would conclude that these were removed or added during a later intervention on the violin. However, on inspection under the microscope, or with UV light, we see that these holes are filled with original varnish. This indicates that Fernando may have used pins temporarily to fix the belly on the ribs, but removed them before, or during the closing of the violin. On less pure instruments one can’t be sure that the holes are covered with original varnish. As usual with Ferdinando’s work, there are no pins on the back. Then there are our ideas about varnish. On this violin, the varnish is much thicker than is usually observed. It’s probably a false conception, when looking at old varnish, that it indicates its original thickness. This violin suggests, rather, that constant polishing of varnishes, letting them first swell, then shrink, decreases their thickness. Besides this, the colour appears more orange then we are used to observe. In particular, those areas which have not been so exposed to light are more intensely coloured. This indicates that Neapolitan varnish may contain colouring agents that are not stable to light exposure. It challenges the view that Neapolitan varnishes were golden-yellow and not intentionally coloured. Another insight concerns the length of the bass-bar. At almost 29 cm, it is nearly 2 cm longer than modern ones, and it overturns the assumption that baroque bars were shorter. Also surprising are the thicknesses of the plates. The top is almost 4.5 mm thick in the sound-post area, reaching 5.5 mm near the bass bar. The back, on the other hand, is over 6 mm thick in the middle area. As the inside of this instrument is very carefully made and finished we can’t assume that the maker has neglected the graduating of the plates, rather that these makers had a different conception of construction than the Cremonese makers. Today, it’s hard to conceive how a baroque violin set with blank gut strings must have sounded with such thick plates and long bass-bar. What modern techniques do you employ in the laboratory to analyse such an instrument? The techniques vary from macroscopical visual examinations with different lights to microscopical examinations by means of light-microscopy up to very advanced spectroscopic and chromatographic analysis at a micro-scale. As conservators and restorers, we are at the interface between the instrument and specialised laboratories. Besides macroscopical examinations, we focus in our workshop on light-microscopy and sample preparation for further investigations in partnership with leading European laboratories. One of the greatest limitations in investigating any ancient artefact is the contamination and degradations that most of them have suffered over time due to constant playing or, in most cases, invasive restorations. This is why this miraculous violin represents a rare opportunity to obtain some crucial information. Did, for example, the Neapolitan makers treat the internal surfaces of their instruments? For the most part such a simple question cannot be answered with certitude because we are not sure if it may have been contaminated by a previous restoration. A single drop of tap water already represents a contamination. If this is not the case however electron-microscopy, or different spectroscopic or chromatographic analyses on micro samples can provide very precise information. Same goes for the varnish. If a violin has received a french polish you can’t get any reliable knowledge about the original surface. The sames goes for the glue. Almost every ancient violin was re-glued at some point and in some places. As a consequence it is extremely rare to find any genuinely uncontaminated drop of glue as we have here. 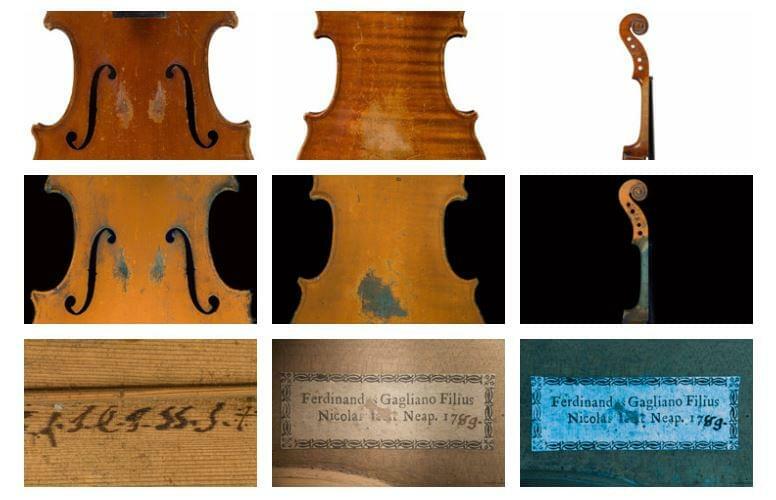 Taking all these aspects into consideration, one should avoid restoring and even making playable this unique witness of the Neapolitan violin-making tradition. As the technological possibilities in the field of conservation science increase every day, we should allow the next generation to obtain far more information from it than is possible for us today. 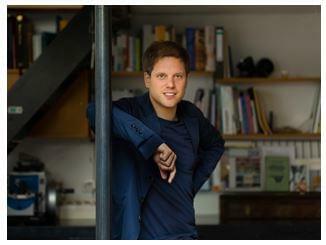 Can you tell us a bit about your own journey to becoming a violin restorer and expert? After studying the cello, I was trained as a violin maker at the violin-making school of Mittenwald and worked for some years as a restorer at the workshops of Jean-Frédéric Schmitt in Lyon and Hieronymus Köstler in Stuttgart. In 2006, I decided to study Conservation and Restoration of Easel Paintings and Polychrome Wooden Sculptures at the Stuttgart State Academy of Art. 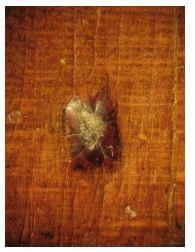 I graduated in 2010 with a Master’s thesis on the oldest surviving lute varnishes. Since then, my research projects led me to work with several European institutions concerning the study of historical varnishes. Our researches pursue two main goals. On the one hand, we aim to get a deeper understanding of historical materials and techniques. The knowledge obtained can help to support the attribution of historical instruments in the field of expertise, and can provide crucial information to make facsimiles and improve restoration treatments. On the other hand, our research focuses on the development of conservation treatments and materials for the care of historical instruments.